Not much has changed since the last 3 Amigos macro update. Amigo #2 (long-term yields) has long-since reached the Continuum’s ™ limiter (the 100 month exponential moving average on the 30 year Treasury yield) and Amigos #1 (SPX/Gold) and #3 (the 10-2 yield curve) are still on their respective trends (up for SPX/Gold and flattening for the yield curve), indicating a positive and risk ‘on’ macro backdrop. Of the 3 wacky riders, with Steve Martin now having gotten home and Martin Short a duller indicator (and lesser light), let’s focus on the Chevy Chase Amigo. There he is on the left, a look of triumphant joy on his face riding one-handed with his arm up in the air. Not a care in the world (as Steve Martin braces for the impact of Continuum’s limiter). The Central Bank instigated asset mania that began in the US with the brilliantly evil Ben Bernanke and his innovative monetary engineering has long-since gone global. The important thing to consider is that Central Bankers have invested years and much of their host country’s and/or economic zone’s seed corn into promoting this asset mania and risk ‘on’ environment. Don’t let them fool you when they go hard, like the currently tightening US Fed; they instigated the asset mania that finally melted down in 2008 and they, in a coordinated manner, instigated the ongoing global boom of today. The problem with Central Bank instigated booms is that they don’t abolish cycles, and when they expire they have a nasty tendency to liquidate in a disorderly manner. Wax on, wax off. They call us doom and gloomers and perma bears simply for acknowledging the obvious; that the thing has been cooked up by will of man (and woman). We all saw it in real time, over a span of years. We witnessed Bernanke cooking the yield yield curve with Operation Twist, we witnessed Bernanke and global Central Banks buying bonds of all kinds in order to shall we say adjust the market’s perceptions of risk. Now the market’s animal spirits (risk ‘on’) have taken over, and with the US Fed ever so slowly stepping aside we are on a countdown to the day that the ‘on’ is replaced by ‘off’ after the word “risk”, which has not been outmoded no matter the lack of experience today’s younger players have with it. I (and by extension, NFTRH) have put in a lot of effort going against the grain of the preceding 4 paragraphs. I have gainfully played as a risk ‘on’ casino patron, finding interesting stock situations in cool industries that make sense for today’s (and tomorrow’s) macro backdrop. While keeping hefty income-paying cash equivalents (like T-Bills), I have been bullish most recently since the big market dump in February. But that is exactly why a player needs to be aware that risk has an ‘off’ button as well, and I think stocks vs. gold is among the best indicators to that. Bear players want to scare you to death (i.e. stimulate emotion like the fear of losing it all) and bull players want to greed you up (i.e. stimulate emotions like FOMO). But a risk vs. reward player remains conscious all along the way and manages emotions, preferably using tools like Amigo #1. There are of course, many more. 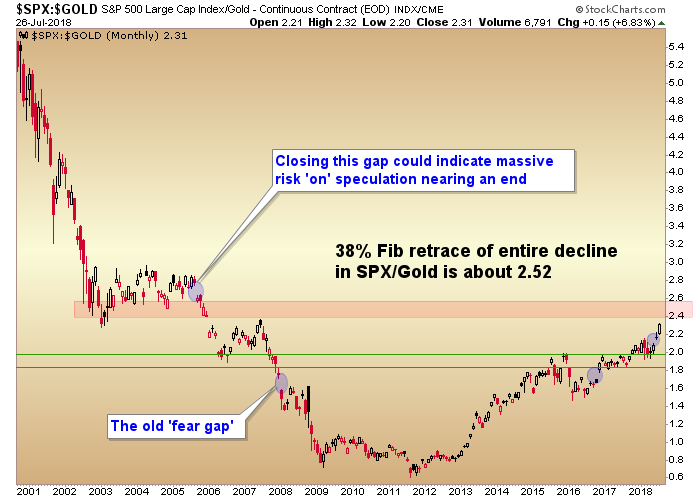 More and more it appears that the climax – if we are right about the 2.50 to 2.75 targeting of this big picture monthly chart – may come sooner rather than later. SPX/Gold is simply booming as the nominal S&P 500 rises to test the January highs (as we’ve anticipated for months) and gold just farts around in the dumps like the lump of inert monetary stability that it is. I had been thinking that maybe there would be one significant pullback in SPX/Gold before the ultimate high, but now it looks like a drive to target may be in play. Whether the target range holds or is crushed as the bulls rampage to a grand new era of risk ‘on’ speculation and greed (like a von Mises style “Crack Up Boom”) is beyond the scope of this article. 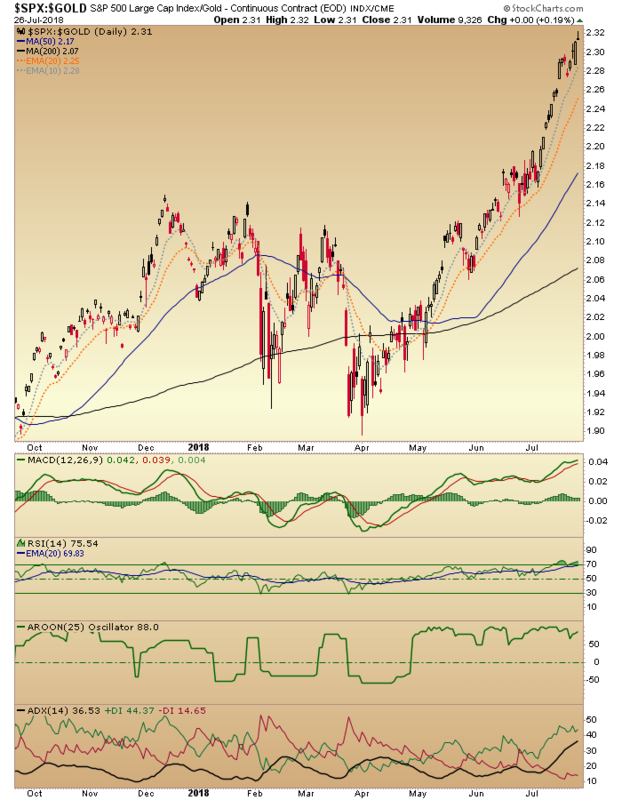 Here we are making an assumption that risk is increasing and the targeting on this chart will mean something. Dialing in a daily view, it’s all systems go. This lends support to the idea that a terminal drive could be on because the indicator is taking on the look of an overbought stock, as it slopes ever more toward vertical while momentum indicators start to flash warnings (like 1: get the hell out of the way of the risk ‘on’ express and 2: be aware that risk ‘off’ comes next). As a side note, if you believe that a daily chart pattern on an indicator can have a functional target, this one measures to 2.40, which is the extreme lower end of the resistance zone noted above. Why, it’s bullish out there! And risk is rising, just as NFTRH anticipated for its subscribers would be the case back in February. What you do with risk is up to you. What I do with it is to try to present it in pictures so that people can make informed decisions about it.